The first time I saw a lady with her two kids in a trike. I had that "Eureka!" moment. You know the feeling don't you? I was thinking "Yes! This is how can I ride with my kid around town." After relishing in the solution to my kid hauling dilemma, independence and opportunity were next on my mind. All the possibilities that cargo bikes could offer people poured in. I am elated to see a kid act on the power of the bicycle to move his business forward. 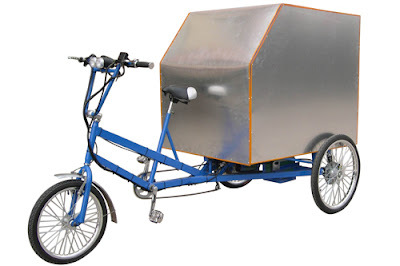 I shared the video in a Facebook group musing about what he could do with a large cargo trike with e-assist. One respondent to my comments asked, "What could he do with an e-assist Cycle Maximus that he can't do now?" The model I was referring to looks something like this. Here are a few things he could do. -Greater hauling capacity means more equipment for an expanded menu of services. -Maybe he hauls two lawn mowers so his brother or a friend can get in on the action as well. -Electric assist would help expand his service range and give him a change to recoup some energy. -Those big empty spaces on the side of the cargo box are begging for signage to promote his business. -If he wanted to add an additional revenue stream he could rent the space on the sides of his trike to businesses who cater to home owners. I talk about that last one in '7 ways to afford the cost of a cargo bike'. Of course he could accomplish most of the same things with larger trailers like these. Maybe it's overkill for a fourteen year old trying to make some extra cash. The point is cargo bikes and trailers offer opportunity for growth that rivals a car without age restriction and all the demands of operation. The cargo bike can enable and amplify the efforts of many kids like Daron. After this video I was compelled to assist people who need the independence and utility uniquely combined in a cargo bike. The young man below only added fuel to the flame. Meet Chauncy. Chauncy became internet famous when he asked a man if he could carry his grocery bags to his car in exchange for a bag of donuts. Listen as he talks about the work he likes to do. The man, Matt White met his need for food right then and there. Then he went further. He shot the video above and set up a Gofundme page to help Chauncy and his mom. As of this post the page has raised over $330,000. Not only that, he as received a new lawnmower to help him get his landscaping business off the ground. Initially I didn't know about the fundraising aspect of the story. My mind leapt to a proper bicycle rig to put him on the path to a sustainable part-time business. Chauncy lives in Memphis, TN. 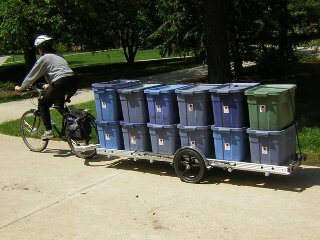 A cargo bike and or cargo trailer would be a great way to beat the summer heat as he moves from job to job. Having seen both of these stories within an hour of each other has made me determined to make Cargo Bike Lane a platform to help as well as inform others. While there are many deserving people like Chauncy few will experience the instant financial generosity he has. 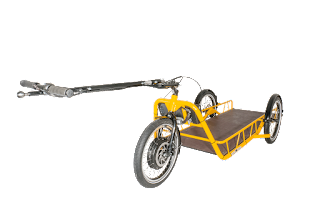 The repeatable and sustainable endeavor is to help finance or out right give someone the type right cargo bike that best meets their needs. Here is what I am doing to be prepared to help the next Daron, Chauncy or Aurelio Jose Barrera who is doing amazing charity work by bike. 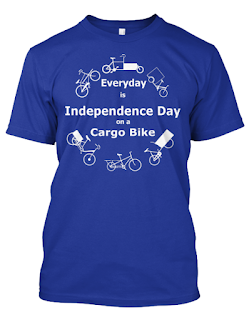 I've designed this t-shirt which is the first in a series based on all the amazing things I have done or seen via cargo bike. Three dollars from the sale of each shirt will be set aside for the next person who needs green transportation for charity or self improvement. Check back often for a tally and progress in building a sound infrastructure for helping others experience the power of cargo biking!